Brick Town Talk: Ivy Lane Pub Crawl - LEGO Town, Architecture, Building Tips, Inspiration Ideas, and more! 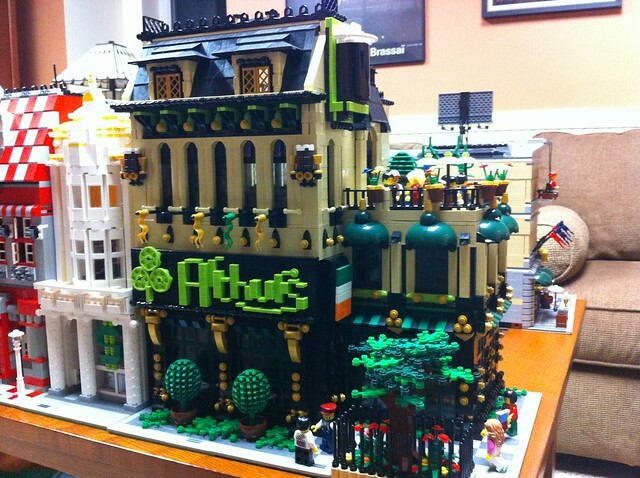 Heritage Boulevard- (BTT) Irish pubs seem to be a popular theme in modular buildings these days. That makes it much harder to have yours stand out. Luckily, this one has what it takes. The upstairs balcony, the cast-iron fence around the tree out front, and the Irish flag adorning the side all make this to be an eye-pleasing building. The beautiful signage is a work of art in its own, with the excellent shamrock logo and hand-drawn nameplate. After all, when stopping down to the pub for a few tall ones, who doesn't want to be wowed by the facade?